Spring cleaning offers a wonderful chance to clear out some clutter from your home and become more organized. When you’re getting ready to do your cleaning this year, keep the following tips in mind to help you out. Piles of clutter can build up inside your home throughout the year. This spring, plan on dealing with each of these piles one at a time. 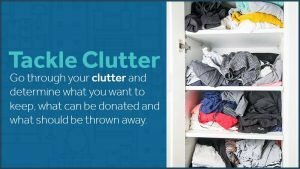 Go through your clutter and determine what you want to keep, what can be donated and what should be thrown away. Make separate boxes for each of these options, and fill them up as you go. You can decide where to put the items in your boxes of things to keep once you’re finished going through everything. While getting out your spring linens, clothing, sports gear and other items, gather up all of your winter items. These items can be stored away until fall so they won’t take up room in your home. You’ll have less clutter overall and be able to quickly get to your spring and summer belongings much more easily. When going through winter clothes and other items you have around your Columbus home, you’ll need to decide whether to keep them or put it away in storage. In general, you should plan on keeping clothing that’s in season, as well as documents, practical items and sporting equipment for seasonal sports. Plan on putting clothes and sports equipment that aren’t in season away in storage until they’re needed. You can also store items that you rarely use, such as extra linens. Spring cleaning gives you an opportunity to clean parts of your home that dust and grime can build up on, such as windows, curtains and light fixtures. Plan on wiping down or washing these areas so you’ll have a home that’s fresh and completely clean. You should also take the time to thoroughly scrub your kitchen, bathrooms and other areas that get a lot of use. When you’re done with all of your cleaning, celebrate by bringing some fresh spring flowers into your home to brighten it up. When you’re doing your spring cleaning, give Zippy Shell a call to get a free quote for our portable storage services in the Columbus area. Our portable storage provides you with a great way to declutter your home while cleaning. As part of our commitment to offer affordable storage, we’ll beat the prices of our competitors by 20 percent. Already using storage? If you pay more than $149 to store your belongings, we’ll beat that price by 20 percent. We’ll also come move your belongings for free to make the switch to Zippy Shell more convenient for you. Give us a call today for more information.